Fruit Remover is a free puzzle game available for iPhone and iPod touch. In Fruit Remover, the basic goal is to clear the board by removing groups of two or more adjacent fruit. The gameplay mechanic is similar to the Same Game which is found on a variety of other platforms. However, Fruit Remover expands on this concept with new game modes and rules. For more information about the game modes, check out the game modes page. Fruit Remover also features online leader boards and achievements via Game Center on supported devices. The idea and name for Fruit Remover were first conceived back in 2004 as a free homebrew game for modified Gamecube game consoles. A demo of that version was released but the game was never completed. A year later the demo was recreated in Java and that version was never released. In fall of 2007, the game demo was rewritten from scratch again for the GP2x handheld and this version was also never released. For more information about these unreleased versions, check out the blog. 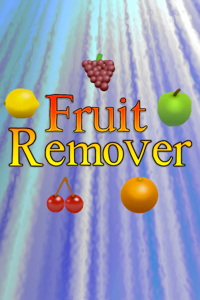 In January 2009, work began on an iPhone version of Fruit Remover intended for release later that year. All graphics, sound, and source code were re-created completely from scratch for the iOS version. After several periods of inactive development, the game was finally completed in April 2011.